Magento Pinterest Product Share : Magento Pinterest product share is an awesome module of magento by which on hover of the product or category on product, anyone can share the image of the product in Pinterest with image , URL and description . Magento Pinterest Product Share - Magento Pinterest product share is an awesome module of Magento by which on hover of the product or category on product , anyone can share the image of the product in Pinterest with image, URL and description . Working of this module is fully dynamic. User can pin image with URL and description. This is a vital module for your store. Having account on Pinterest is important for sharing the images or you have to create an account on Pinterest for sharing. 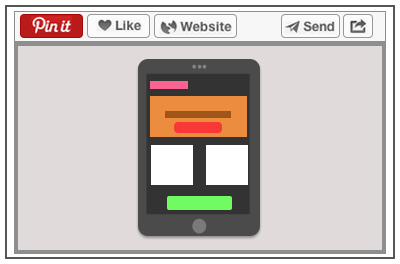 After the installation of the module, your website is ready with Pinterest feature. 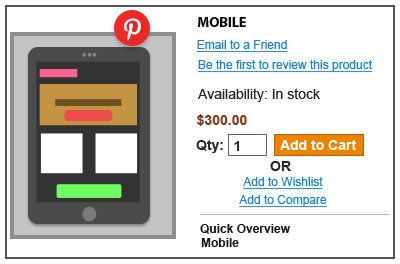 Now user can see the Pinterest icon on the category as well as on the product page. This icon will come with mouse hover, so user will hover over the product and category page and can see the icon. After mouse hover, icon is seen on the product and category page. Icon is seen on the top of the product image. For sharing the image, user will create a pin by selecting the board and writing a short description about the image. After pinning that image, user can see that shared image on the pin board, with website url option. User will create a pin for sharing the image by selecting the board and writing a short description about the image. After pinning, user can see image with URL. Did you buy Magento Pinterest Product Share?